Nine YSU students graduated from the 2016 Export Program this past May. From left: front row, Jana Janson, Hailey Sturtz, Mousa Kassis (International Trade Advisor with SBDC at YSU). Mohammed Yusuf and Robert Grahovac; back row, Ben Smith, Connor Kesner, Daniel Hess, Tibor Baki and Dumitru Silviu. The Ohio Development Services Agency’s Export Assistance Office was recently awarded the President’s “E” Award for Export Service for its Ohio Export Internship Program. The Ohio Export Internship Program is a partnership between the Ohio Development Services Agency, the Williamson College of Business Administration at Youngstown State University, and the Fisher College of Business at Ohio State University. The President’s “E” Award is the highest recognition any U.S. organization can receive for making a significant contribution to the expansion of U.S. exports. 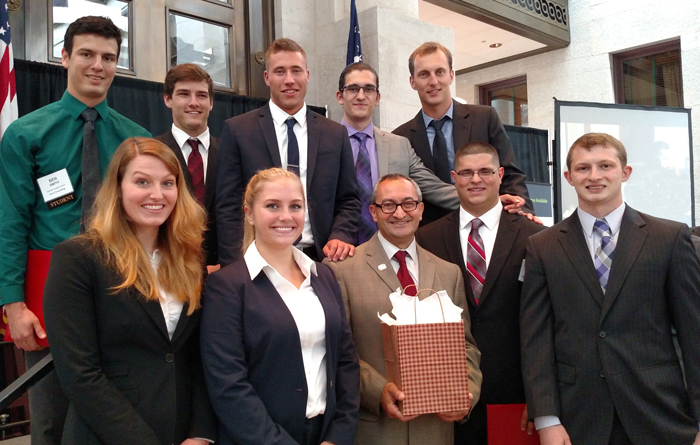 The Ohio Export Internship Program began with Ohio State University in 2012, and YSU was added as a partner in 2014. The program combines a spring semester exporting course with a paid summer internship focusing on export sales growth. The ODSA reimburses companies up to 50 percent or $3,600 for the internship stipend. Nine YSU students completed the Export Internship Program in 2015 and 11 students, including two from the University of Akron, are in the 2016 program at YSU. In the past four years, the students have helped generate more than $500,000 in direct export sales for their companies and more than $19.5 million in estimated global sales. Of the 83 companies that have participated in the program, 34 have offered internship extensions and 17 have made full-time job offers. For more information on the Ohio Export Internship Program at YSU, contact Mousa Kassis, international trade advisor with the Ohio SBDC Export Assistance Network, at 330-941-2415 or mhkassis@ysu.edu.